After a stunning trip to Vietnam, the clinic is now back open and fully operational. Picture is a room with a view! 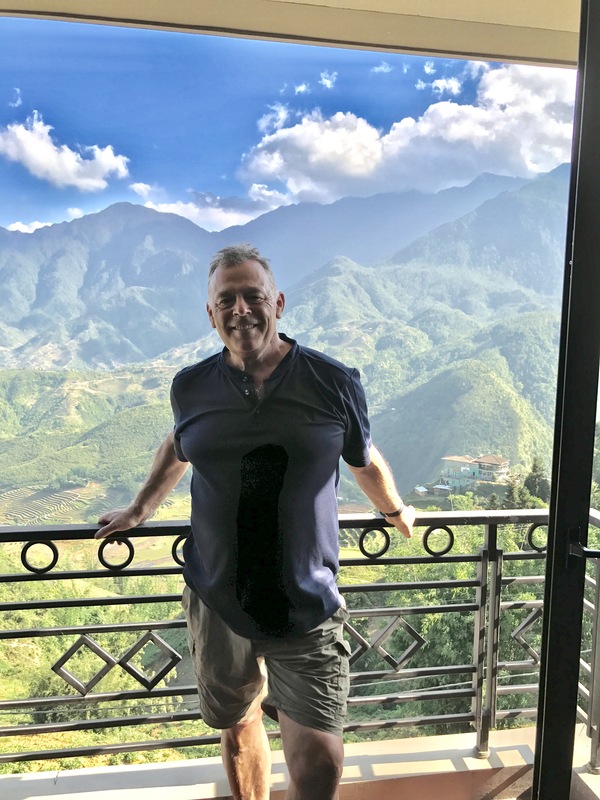 Three days of 15km morning hiking in the beautiful hills around Sa Pa, North Vietnam amongst the Black HMong minority peoples. Many thanks to all patients for putting up with our absence enabling this great journey. In the UK now we hit the height of the holiday season. Long journeys heavy luggage, bad beds, little sleep and likely too much alcohol! If you want to avoid stiff necks and bad backs heed some of the following advice. Laying on your side reading your kindle or a book for a prolonged period requires the muscles of the neck on the upper side to work hard holding the head still. Later in the evening or next day these muscle shorten and can then pull the first and second Rib up irritating the ulnar nerve referring issues to the hand. So change sides regularly and stretch the neck muscles after prolonged reading. When getting into bed make sure the pillow suppports the neck also especially after few glasses of wine. The same principles apply to the lower back muscles. Wise to do a few mobility exercise first thing in morning and stretches. Visit the website stretching pages. In any event enjoy your holidays. It is at this time of year that we all head to the tennis courts at home or on holiday. Wimbledon has finished and we all want to emulate our favourites, donning our short white skirts shorts and lycra tops. All the golf on television and the great weather encourages the budding golfer to spend hours on courses or weekends away with buddies playing two or three courses over a weekend between drinking and late nights. Of course not to mention 4 hours in the car driving like a maniac with both hands gripping the steering wheel whilst tearing along the motorway at max speed. ( a great way to pre-tension the forearms before 54 holes of golf! Of course we play for hours, as many sets as possible, determined to win and look good doing so. Well, that is… until we develop pain in our elbows wrists shoulders and back! Painkillers don’t do much, doctor puts you on waiting list and anti inflammatories, some of us buy elite straps and carry on for a while. Most of us find the wine is a much easier option. Of course we can. We have all of five minutes to assess treat and prepare a treatment plan and prognosis. Assess the point of pain/pains, determine the probable mechanical cause, check to see if distal posture is maintaining the problem. Then treat it all. Soft tissue and shortened origin muscle stretching, normally on all extensor and flexor muscles of the forearm, Same thing on the Biceps as the tendon blends in with the fascia of the forearm and pre-tensions it. Open the chest and mobilise the back as we notice our patient has round shoulders and head forward posture. Result of spending all day on computer and smart phone! Advise patient to ice the affected areas where muscles attach to bone on inner or outer elbow. Increase the size diameter of tennis racket or golf club handle. This reduces grip tension on forearm muscles. Can use some foam in palm of hand also. Remind patient that it take years of practice before we stop gripping the handle as if it was a life or death action. Professionals do Not need to grip the handle, it becomes an extension of the body. Oh yes, all in the last 5 minutes of the appointment, so probable better to book in a few days later for a follow up. Many apologies to the next patient for running late! Can we help, yes of course we can! Please book in when the problems start not three months later when it begins to affect your daily life. Four out of five people suffer from lower back pain. This article highlights a solid reason for why a good night’s sleep is the foundation of physical health and mental energy.